In a 12- week dermatologist controlled clinical study, SkinCeuticals Reservatol BE greatly improved radiance, firmness, elasticity and density. An 18.9% increase in skin density. The controlled clinical trial was conducted on 55 women, ages 45-60 with mild to moderate discoloration, laxity, fine lines and wrinkles. Reservatol BE boosts the NRF-2 protein, the skin's natural defense and self-reparative system against antioxidants. With age this internal defense system looses it's efficacy. Reservatol , known as the longetivity molecule , is derived from the knotweed plant and when combined with the antioxidants Alpha Tocopherol ( a pure form of Vitamin E ), and Baicalin ( derived from roots of Baikal skullcap ) offer superior results over a single ingredient antioxidant product. 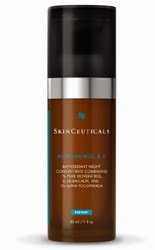 Reservatol may be used in conjunction with a retinol product or in lieu of retinoids for intolerant patients .